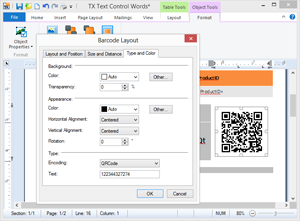 Using TX Barcode .NET for Windows Forms, you can add fast and accurate 1D and 2D barcodes to your .NET based applications. Integrate barcodes into reports, invoices and mail merge templates. Generated barcodes are optimized for printing and on-screen scanning. Add fast and accurate 1D and 2D barcodes to .NET based applications - optimized for documents and reporting. 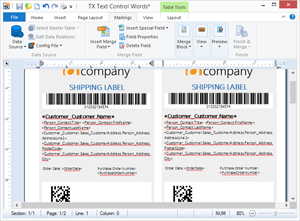 TX Barcode .NET for Windows Forms has been specifically designed for the requirements when integrating barcodes into documents, such as invoices. In such documents, the barcode size must be fixed, even if the barcode length differs. 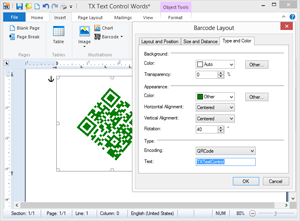 TX Barcode .NET for Windows Forms implements smart ways to control the actual barcode size and alignment. 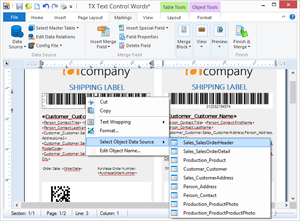 TX Barcode .NET for Windows Forms supports the major of industry standard barcode types that are required in paper and PDF based processes, such as invoicing and shipping. The following one-dimensional barcode types are supported by TX Barcode .NET for Windows Forms. Barcodes can be used as placeholders in reporting templates. Each barcode object is assigned a unique ID and Name in order to visualize actual data during the merge process. This can be done by iterating through the Barcodes collection in TX Text Control or automatically when the Reporting class MailMerge is used. TX Text Control ships with a barcode settings dialog box as standard that can be used to change the type, text, color or angle. Programmatically, you can change the foreground color, background color, rotation, alignment and text rendering.